It is early morning at the Three Camel Lodge in the Gobi Desert. The panorama is so soothing that the heart begins to beat slower. The vista is expansive: flat grassland where a watering hole attracts herds of animals. From the left, a group of short Mongol horses…they do not run…glide into view. When they have drunk the water, a herd of cattle swan in gracefully from the right. 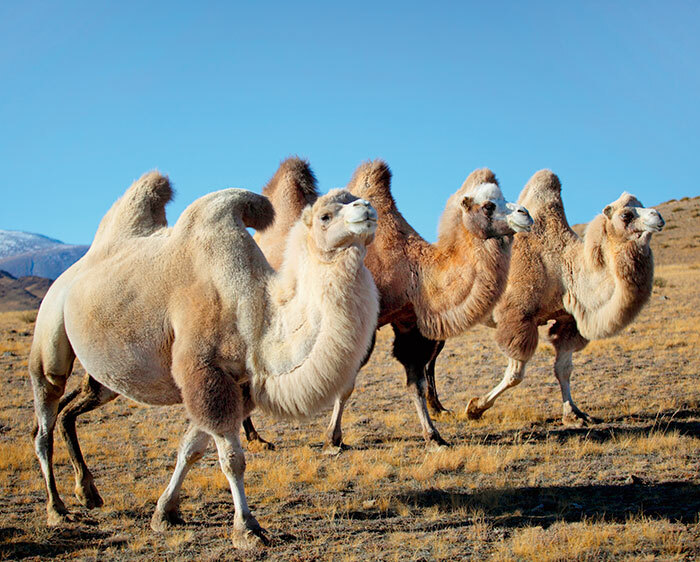 Later, Bactrian double-humped camels saunter across; followed by a trail of goats. The sky is a light blue and the air is icy. This calm is so inspiring that I decide to change my collection for fashion week. I did not ever dream to find such tranquility in, of all places, Mongolia. A month before we departed and flew into Ulaanbaatar from Hong Kong, I read every single book on Genghis Khan, founder of the Mongol Empire in the 13th century. I felt like I knew him personally. Knew his mind, his conquests and his vision of a single world that changed the face of the earth…from the Far East to Europe…. I ‘thought’ I knew him inside out till we experienced the dream of actually being in Mongolia. What books tell you describes a vision. The reality is infinitely more stunning in its grandeur. Barely did we land in Ulaanbaatar, than we took off to the Gorkhi-Terelj National Park and a luxurious hotel in Gorkhi called, well, The Terelj Hotel, an oasis of sumptuousness. From the welcome in a ger tent with the traditional yatga, a cello-like Mongol instrument, to the Italian marble suites, the opulence gives an idea of the times and wealth of the great Genghis Khan. That evening we rode on Mongolian horses. So short that one must hunch, almost squat, on them. But perfect for the Mongols to turn around and shoot arrows at the enemy. Warfare that ensured Genghis success. He was so clever that the warriors were provided with armour only at the front. Their backs were bare so that Mongol soldiers could never flee the enemy. In the evening, we were treated to Mongolian ‘throat’ songs, gymnasts that double as fluid contortionists and musicians who are a wonder to behold and listen to. Over a warming fire, we sip champagne and watch the sun go down over the majestic mountains, pine trees and a gurgling, clear river. 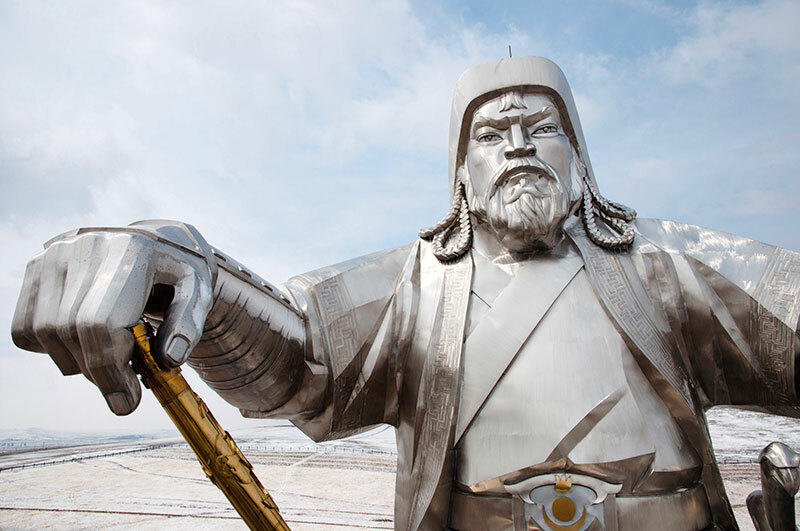 The next day at Tsonjin Boldog, a site where Genghis dropped a golden whip, I marvel at the towering aluminium and stainless-steel statue of the famed conqueror surveying the vast plains. One can climb into the statue to the head of the horse and gaze over what Genghis must have surveyed in his time. In a few hours, we are in an Mi-171 helicopter to Uushiglin to see the famed Deer Stones, while a French chef in a ger tent rustles up a luxurious lunch. How the nomadic Scythians arrived here from Europe and left their gravestones is baffling. As baffling as the connect between the Canadian Inuit tribes, the Norwegian Sami tribes and the Mongolians whose tepees and customs match…as if they were cousins separated by vast continents. A short heli trip away is Lake Hövsgöl, the ‘Dark Blue Pearl of Mongolia’. It sits serenely in the cold. The Eg River connects this water body to Lake Baikal in neighbouring Siberia (once part of Mongolia, before it was annexed by the Russians). If this is summer, I don’t want to know what winter is like. Brrr…it is frrreezing! The Toilogt ger camp is a good base from which to see what is around. Apart from the shamans at Lake Tsagaan Nuur in the Shishged valley, there are also the wondrous Tsaatan or ‘reindeer people’. When one meets these reindeer herders, one understands the true love between man and animal. The tribe uses the reindeer to travel, to make woollen clothes from their moulting fur and for milk. Children sleep with the reindeer while parents forage for food and firewood. 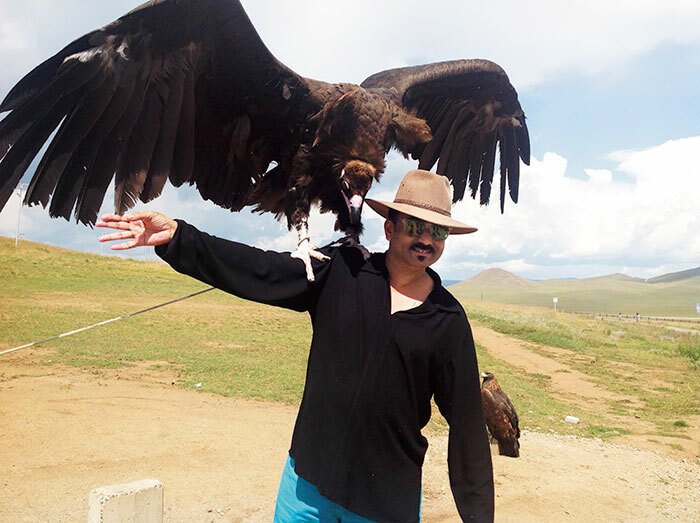 To see Mongolia in luxury and at a quicker pace, scout for a helicopter that can give you panoramic bird’s-eye views and save time travelling on the rough Mongol terrain. 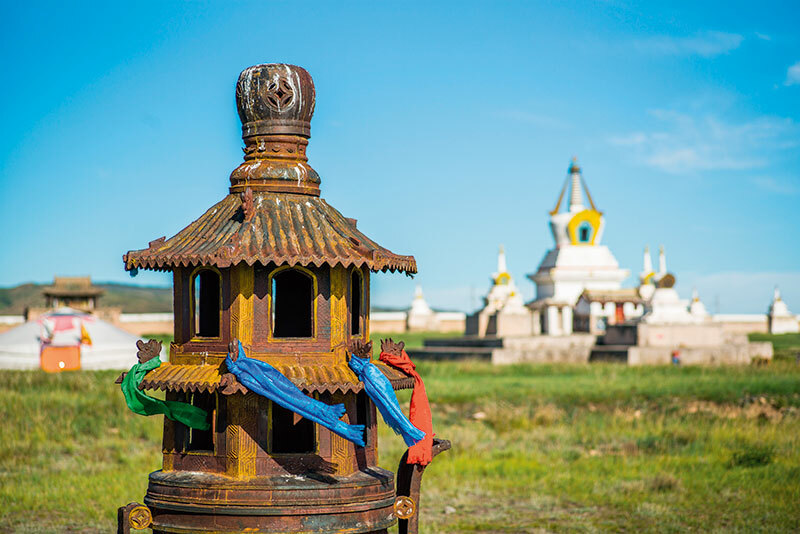 We fly to Erdene Zuu Monastery in ancient Karakorum. The chief lama at this walled monastery (built by Genghis’ son, it was destroyed by the Russians) welcomes us. At one time there were hundreds of stupas. Today, just three look over the grand expanse. The lama speaks fluent English. He blesses me with a wooden bead bracelet that I wear till today. One can sense the holiness of this site. I meditate in one of the temples and discover true inner peace. Which brings us back to Three Camel Lodge. This must be the most luxurious ger tent hotel on the Mongolian plains. We witness a traditional Naadam festival with wrestlers, horse riders and archers. They are warm as toast; we are frozen to the core. The festival is a display of the core strengths of the Mongols. It is an amazing visual experience; we watch while we sip ayrag, fermented mare’s milk, in small bowls; Mongol delicacies include khuushuur (samosa-styled pastry stuffed with meat) and khorkhog (mutton broth cooked with vegetables). If you are a vegetarian, carry two-minute noodles like I did. From the Three Camel Lodge, one can visit the Khongoryn Els dunes. The Duut Mankhan or ‘singing dunes’ are worth a camel ride for the not-so-faint-hearted. Beware of camel stink. Carry a deodorant along. 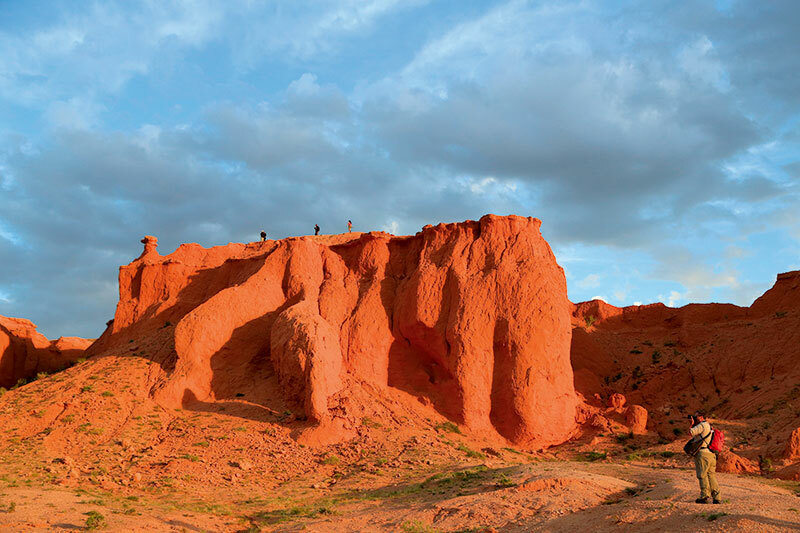 Also worth a visit is the world’s first dinosaur site at Bayanzag, also called the ‘flaming cliffs’ for the stunning fiery hues that the cliffs take on at sunset. A local palaeontologist was digging out the head of a Protoceratops. He said it would take him many months to get the entire body out as the dinosaurs were buried head-up. The bodies are many metres under the ground. A good dino skeleton can fetch many million dollars. So the site is under tight security. As you can imagine, a voyage like this one is no walk in the park. After two weeks, we are tired, hungry, thirsty (despite the Chinggis Khaan Vodka. By the way, being Muslims, they call vodka ‘white tea’ from Kashgar China to Uzbekistan). The perfect remedy is to keep the capital Ulaanbaatar as the final stop. The Blue Sky Hotel and Tower, a Burj-Al-Arab-inspired architectural statement, is the best respite for the body and soul. 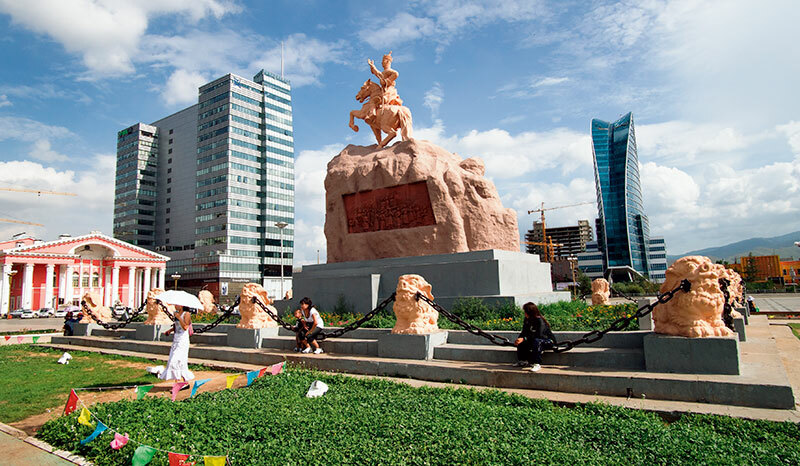 It is bang on Chinggis Khaan Square, previously named Sükhbaatar Square, the largest in the nation. Named after the leader of Mongolia’s 1921 revolution, the area is a beehive of activity and impressive Soviet-esque buildings. For a posh dinner try the Monet Restaurant across the hotel. I carry memories of a warm, friendly people, incredible terrain and a sad story of Russian and Chinese colonisation. But the Mongols are a happy people, looking to the future with hope. On the entire Silk Route from China to Georgia, what invades my dreams most often is Mongolia. Go now before commercialisation rears its ugly head and the countryside is filled with concrete. Till that happens, this is an exotic, delicious, Mongolicious flavourful holiday destination.